Disclosure: This is a sponsored post for Dannon Oikos Greek yogurt for which I received compensation. The recipe and opinions on ingredients are my own. Whether it’s a cup of hearty soup paired with a big salad or a generous bowl of soup paired with a small salad, the soup and salad combo is pretty genius. The pairing makes for a thoughtful, seasonal meal that’s rich with flavor and easy to prepare. I also love how soups and salads take time to eat as we spend too little time enjoying food and family at the dinner table. 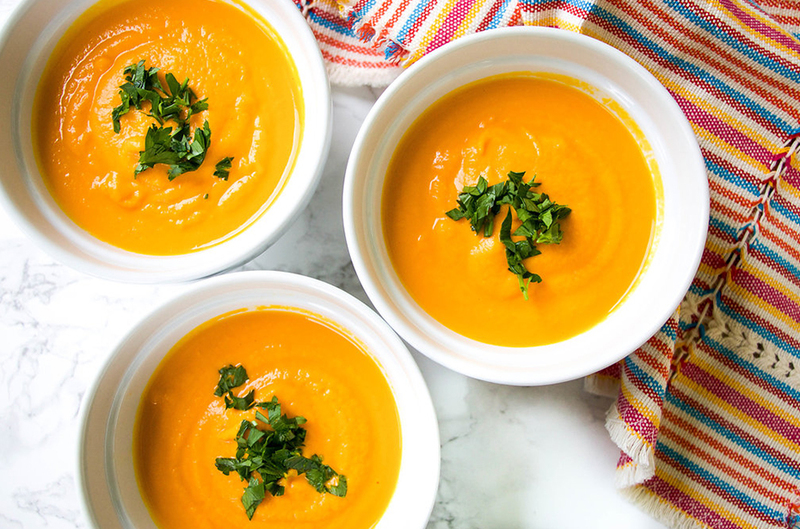 My latest soup blend is a carrot ginger soup prepared with only five main ingredients you likely have in your fridge and pantry: carrots, shallots, ginger, broth and Greek yogurt. Roast the first three with a little olive oil and then blend with the broth and yogurt plus a little salt and pepper, and dinner is done! Not only is it delicious and beautiful (check out that color! ), thanks to the addition of Dannon Oikos plain Greek nonfat yogurt with 15 grams of protein per 5.3 oz serving, it’s also an excellent source of protein to pair with my simplest, best green salad. As a nutrient-dense and protein-rich food, Dannon Oikos Plain Greek Nonfat Yogurt has become my go-to for blended soups. 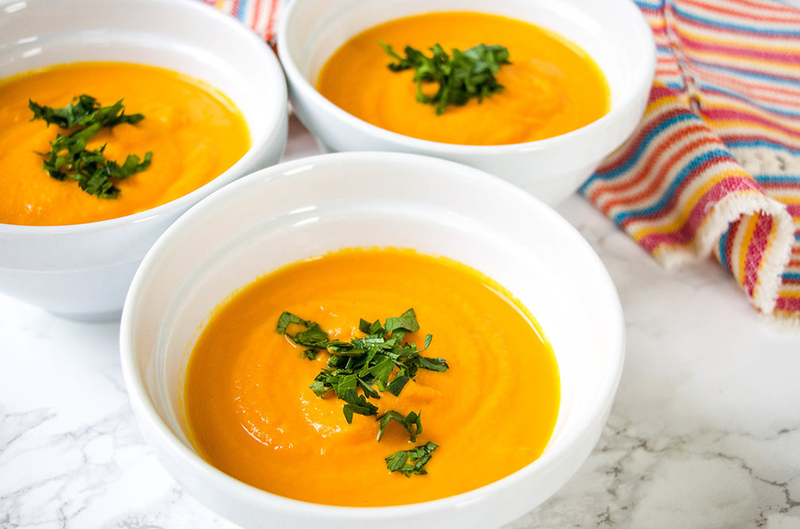 The protein helps with satiety since it is the most satiating nutrient, the texture makes it a big bowl of creamy deliciousness, and the ingredient list is something I can feel good about serving my family. Line a large sheet pan with parchment paper (easy clean-up) and place the carrots, shallot, and ginger on the pan. Drizzle with olive oil, and sprinkle with salt. Roast in the oven for about 25 minutes or until tender and slightly caramelized. 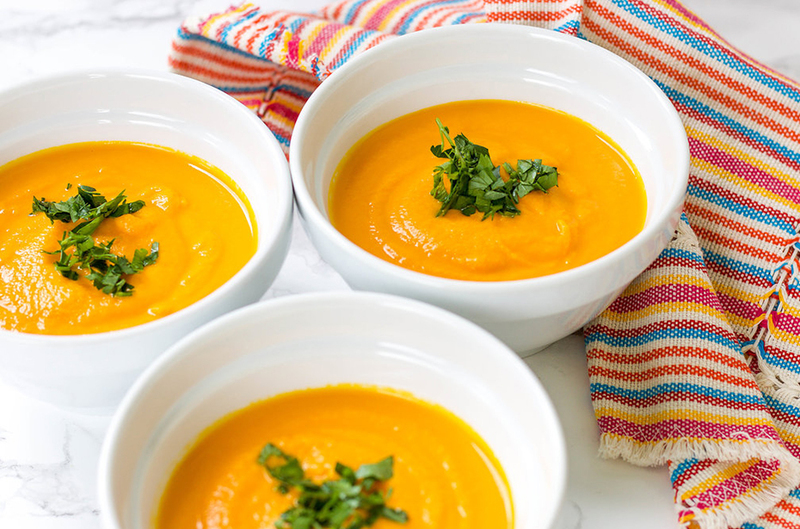 Blend the carrot mix with the broth and yogurt in batches. A powerful blender like a Vitamix works best. Add salt and pepper to taste. Sweet and spicy beet salad for a bright and beautiful vegetarian meal. These flavors get even better with time. Make enough for leftovers!